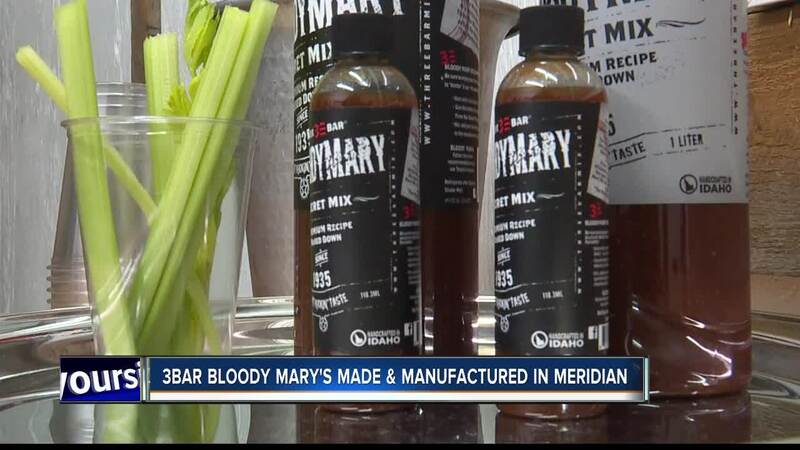 MERIDIAN, Idaho — According to Robere Kazadi, co-owner of 3Bar Bloody Mary Mix, "Bloody Marys--they can be really good, and they can also be really bad." One Bloody Mary recipe just happened to be "really good" to Robere and his business partner Patrick. So good, that the two would drive over an hour to Idaho City to a small bar called "Diamond Lil's." The more they had this unique Bloody Mary mix, the more they fell in love with it. This recipe started in Wyoming, moved to Missouri and landed in Idaho. It's been passed down for over 80 years. The man in possession of this secret family recipe had no intention of selling the recipe, but after a year of convincing, Robere and Patrick were able to buy the recipe and rights to manufacture it. With roots at three separate bars in three separate states, the mix earned its name, "3Bar." The man behind the secret family recipe is not an active partner with the company, but Robere and Patrick were keen on keeping the product as authentic as possible. "What makes it so good is that it's exactly what you'd get from him if you went up to Idaho City and ordered a Bloody Mary."